What exactly is Virtual Reality? It’s not film. It’s not television or web storytelling. It’s not art. It’s easy to describe its characteristics: with the aid of an individual headset and headphones, VR creates a multimedia vision with depth of space and progression of time. But it’s much harder to get a sense of this nascent creative technology’s aesthetic possibilities, of the things that make it unique relative to art. Until engaging with Down the Rabbit Hole, the 2016 Sydney Film Festival’s VR exhibition, I had not met a VR work that leapt beyond purely technological appeal. Its artistic possibilities strike me as still latent. The absence of hard-and-fast rules and conventions make it an exciting area for artists to work in—to play freely and experiment. One recent experiment in applying narrative principles to the 4D world is artist Lynette Wallworth’s Collision, shown at Carriageworks last month. 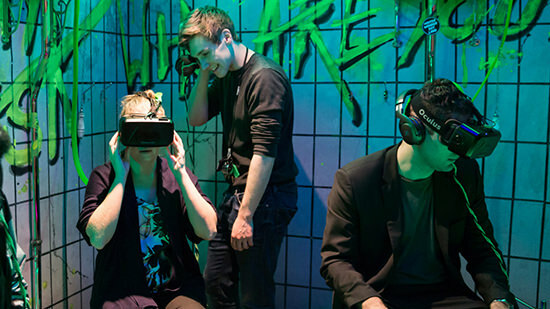 The winner of SFF’s inaugural UNESCO Sydney City of Film Award, Wallworth has made a career of using immersive technologies to create filmic works, with Collision forging a space between VR and documentary storytelling. But generally, without the progression of plot, VR is at the point of exploring the visual and spatial mechanics of the medium—an infatuation with the actual technology. That was the feel of A History of Cuban Dance (US, UK, Cuba; lead artist Lucy Walker) and The Rose and I (USA; lead artists Eugene Chung, Jimmy Maidens, Alex Woo). Inspired by The Little Prince, The Rose and I reimagines Antoine de Saint-Exupéry’s iconic illustrations as animations. In a candy-coloured galaxy, the Prince emerges on a small, lonely planet. He watches a rose bloom from a crater and tends to it within the wider expanse of his empty universe, the sun rising and setting all the while. In a sense, the Prince’s lone predicament should be well suited to the VR format. When attended alone, cinema can offer a type of public solitude, in contrast with SFF where you are likely to be in a packed auditorium with 800 strangers. Virtual reality, on the other hand, is a purely solitary experience. With your helmet on, the experience of the work is unsharable. At five minutes and with a linear, single concept, The Rose and I feels most like an animated short film with a few 4D enhancements. Similarly, A History of Cuban Dance had the feel of a documentary from the online magazine Vice. In brief chapters of live action, dancers in various Havana locations perform the Afro-Cuban Santería rumba, mambo, cha-cha-chá, salsa, breakdancing and reggaeton with typographical information popping up to the viewer’s left and right. The project’s success lies in the way it harnesses the potential of VR to capture wide vistas. By combining traditional one-point-perspective with a 360-degree view, Havana’s long seaside roads and cavernous architectural interiors are made quite real and quite lovely. Though enjoyable, neither of these films felt more immersive than a fully-realised video work, such as Hossein Valamanesh’s Char Soo currently showing at Sydney’s Carriageworks and as part of SFF’s Beyond Cinema program. 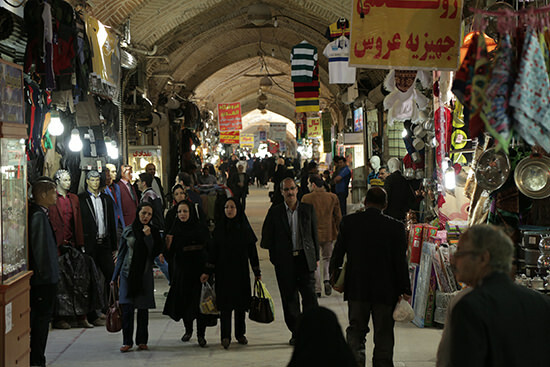 Here the artist places the audience at the centre of an intersection in an Iranian market, its roads extending out and away via four video channels with discreet edits to transition us through a whole busy day in this market’s life. Sometimes a motorbike will cruise towards you on one screen and turn the corner into another. The scale of the projection and the four-screen set-up make for a genuinely immersive experience barely matched by most VR works, which by comparison are small, intimate affairs offering an often passive and solo spectatorial experience. In a way, Char Soo is more cinematic than animation projects like The Rose and I. Indeed, it’s produced by art and film production company Felix Media, manifesting a much larger set of professional video skills than any single contemporary artist could ever muster. The most engaging work of Down the Rabbit Hole, to my mind, made that isolation a strength rather than a weakness. Notes on Blindness: Into Darkness (UK, France; lead artists Arnaud Colinart, Amaury La Burthe, Peter Middleton, James Spinney) is an extension of Notes on Blindness, an experimental documentary in competition at SFF. When theologian John Hull’s sight began to dim in 1983, he commenced recording audio diaries in order to come to terms with the meaning of blindness. Filmmakers Middleton and Spinney rearticulated the diaries in filmic form for their documentary. The VR project (see the trailer) takes this one step further, plunging us into the eyes of Hull, who for several years could detect light at the periphery of his field of vision and as it bounced off forms. The effect in VR is very much like seeing images of light pollution around the world: dark and monochromatic with spidery pinpricks of soft light. We sit on a bench in a park, listening to Hull’s observations, seeing and hearing the world as he sees it. “I hear the footsteps of people walking past,” he says into our ears, and those footsteps appear aurally. In this way, we come to understand the importance that sound holds for the blind. The work uses audio sourced directly from Hull’s tapes and presented binaurally, which means the sound changes depending on how you move your head. When sitting under a park pagoda, we look at a bird, we hear it chirp; when we look at a leaf, we hear it rustle with others; when we look at a duck in a pond, we hear it paddling. At Hull’s instruction, we look to the right, and hear a breeze moving through the trees. He says that all these sounds create “a world of activity. In the blind person’s appreciation of weather, wind takes the place of sight.” In particular, the sound of rainfall in the park creates a totally different auditory picture of the surrounding landscape. The work is a wonder. The project’s great quality lies in the sense of empathy provokes. Through the specific technological and artistic capabilities of VR, we are pulled a step closer to knowing the sensual predicament of sightlesssness. As such, the work offered something more immersive than a regular film screening, even a 3D one, and genuinely marked an extension of the original documentary, which is in itself quite miraculous and experimental. With form and content bonded, it actually needed the technology of VR to realise its aim of giving the audience some sense of the experience of incipient blindness. Up until Notes on Blindness: Into Darkness, my experiences with VR had felt most akin to those I’ve had with video games. This was especially the case with Björk Digital at Carriageworks in Vivid Sydney last month, which the artist admitted was not fully realised. The experience was marred by poor event management and overcrowding, but also possibly because the work was ill-conceived artistically. Staged inside Björk’s mouth with the audience situated on her tongue and with the back of her teeth visible, the work was interesting and worthy as an experiment, but I sense that VR is more suited to broad horizons, imaginable scales and tangible sets of spatial dimensions. Perhaps VR is not so much a discrete discipline or a new branch of an existing artform as a platform and means of delivery; like television, its aesthetic application can vary depending on the project. Tellingly, all the works in Down the Rabbit Hole were put together by small-scale production teams, the kind that also produce short films, high-end commercials and video clips. This is not the arena for a solo artist, or even an artist with a production team behind them, as is usual with large-scale video works. It’s exciting that a technology exists that allows for changes to the world of film and art far away from Hollywood. But until the content catches up with the form, VR will continue to be about experiments in form. Notes on Blindness: Into Darkness showed what might be possible in this emerging technology’s artistic future.